Increased export of biologically available nitrogen (N) to the coastal zone is strongly linked to eutrophication, which is a major problem in coastal marine ecosystems (NRC (2000) Clean Coastal Waters: Understanding and Reducing the Effects of Nutrient Pollution. National Academy Press, Washington, DC; Bricker et al. (1999) National Estuarine Eutrophication Assessment. Effects of nutrient enrichment in the nation’s estuaries. NOAA-NOS Special Projects Office, Silver Spring, MD). However, not all of the nitrogen input to a watershed is exported to the coast (Howarth et al. (1996) Biogeochemistry 35:75–139; Jordan and Weller (1996) Bioscience 46:655–664). Global estimates of nitrogen export to coasts have been taken to be 25% of watershed input, based largely on northeastern U.S. observations (Galloway et al. (2004) Biogeochemistry 70:153–226; Boyer et al. (2006) Global Biogeochem Cycle 20:Art. No. GB1S91). We applied the N budgeting methodology developed for the International SCOPE Nitrogen project (Howarth et al. (1996) Biogeochemistry 35:75–139; Boyer et al. 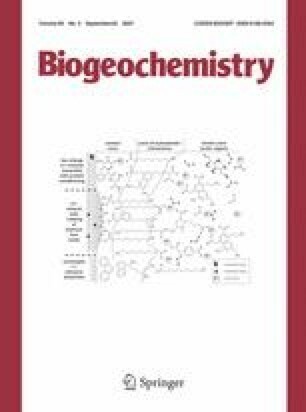 (2002) Biogeochemistry 57:137–169) to 12 watersheds in the southeastern U.S., and compared them with estimates of N export for 16 watersheds in the northeastern U.S. (Boyer et al. (2002) Biogeochemistry 57:137–169). In southeastern watersheds, average N export was only 9% of input, suggesting the need for downward revision of global estimates. The difference between northern and southern watersheds is not a function of the absolute value of N inputs, which spanned a comparable range and were positively related to export in both cases. Rather, the proportion of N exported was significantly related to average watershed temperature (% N export = 58.41 e−0.11 * temperature; R 2 = 0.76), with lower proportionate nitrogen export in warmer watersheds. In addition, we identified a threshold in proportionate N export at 38°N latitude that corresponds to a reported breakpoint in the rate of denitrification at 10–12°C. We hypothesize that temperature, by regulating denitrification, results in increased proportionate N export at higher latitudes. Regardless of the mechanism, these observations suggest that temperature increases associated with future climate change may well reduce the amount of nitrogen that reaches estuaries, which will have implications for coastal eutrophication. We thank E. W. Boyer, R. W. Howarth, K. A. Payne, J. E. Sheldon, B. Binder, A. B. Burd, and A. E. Giblin for useful discussions and technical advice, J. T. Hollibaugh, L. R. Pomeroy, and R. W. Howarth for comments on an earlier version of this manuscript, and K. Lajtha and J. Schimel for their editorial support. Financial support for this work was provided by the Environmental Protection Agency (STAR Grant R830882) and the Georgia Coastal Ecosystems LTER Project (NSF Award OCE 99–82133).